Allows for full access to all the features of your phone, including the microphone or audio jack, without removing the phone from the case. Can be adjustedto your preferred viewing angle on handlebars with 360 degree rotation. Allows for safe and comfortable hands-free phone access while in motion or on the road. 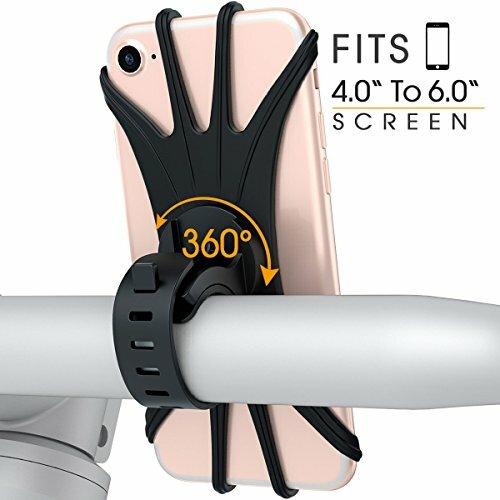 The flexible silicone absorbs all shock, so that your phone will not rumble or shake The innovative silicone belt allows you to easily and quickly attach or detach from any size of handlebar, including on a stroller or treadmill. This is our patented product, we have our own professional R & D team and professional after-sales service. If you ever have any questions or concerns about the product, please contact us. If there is any issue with the product we will gladly supply a replacement. UNIVERSAL DESIGN - compatible with any smartphone with a screen size between 4 to 6 inches, including Android, iPhone 5 to iPhone 8 Plus/iPhone X. Common case brands that are compatible include Otterbox/Lifeproof. Please read the description to see complete compatibility. The holder will not obscure the camera lens or buttons, allowing you to easily take photos or videos while riding!